The BMW 4-Series Coupe Concept has unveiled , BMW is looking ahead to the fourth generation of its sporty mid-range coupe - and reasserting its global leadership credentials in the process. The BMW 4-Series Coupe Concept adds a new spices to the qualities of the BMW 3-Series Coupe in terms of aesthetics, dynamics and elegance. The "4" doesn't just mark the start of a new cycle, it represents the zenith of a development curve. BMW has given the new model its own individual character and a standalone design - and, in so doing, has turned "4" into segment shorthand for aesthetic and dynamic appeal. The latest addition to a nomenclature that sees BMW building on the fine tradition of its large BMW 6-Series and BMW 8-Series Coupes, the "4" stands for greater sportiness, greater exclusivity and even clearer differentiation from the BMW 3-Series range. About looks the BMW 4- Series is fully loaded with jaw dropping style . It’s GANGSTER eyes style headlamps has perfectly matched with its design . The two doors and body bumper enriched it’s sportier looks. The BMW 4-Series Coupe Concept allows the driver to experience the essence of this new, sporting and elegant generation of car in the lap of contemporary luxury. An array of high-quality details provide an exclusive showcase for the car's perfectly balanced coupe proportions. Inside, the expertise of BMW Individual, skilled handcraftsmanship and carefully selected materials combine to create a supreme interior. The role of BMW Individual in the BMW 4-Series Coupe Concept's development clearly underlines the brand's commitment to challenging itself constantly in pursuit of perfection. These first official pictures show the new two-door to be a muscular and broad-shouldered design draped over a wide-stance platform. BMW has released the key dimensions for the concept, which are expected to be carried over to the production car with very little change. They include a 2810mm wheelbase that it shares with the 3-series saloon. At 4641mm long, 1826mm wide and 1326mm high, the new concept is 17mm longer than the saloon, 15mm wider and a significant 67mm lower, a dimension that emphasises the two-door’s sportier footprint. The front and rear tracks reflect the squat look, too. At 1545mm, the front is 3mm wider than the saloon and the 1593mm rear is 10mm wider. Despite the brief for a sportier, more individual look, designers have crafted bodywork that broadly follows the theme of the 3-series saloon, with a distinctive swage line running along the bodyside and linking the front and rear haunches by running through the door handles. 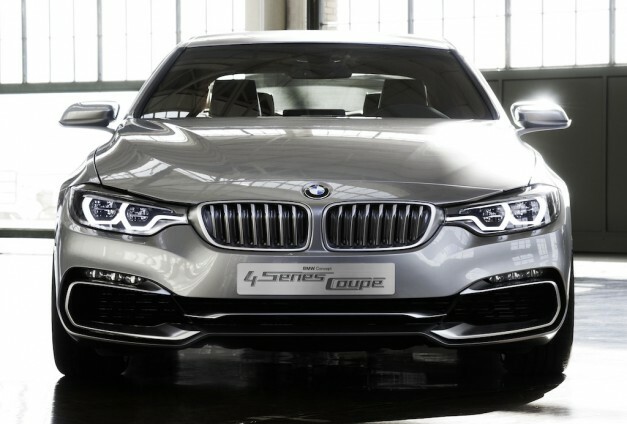 Where the 4-series concept asserts its identity is in the execution of the swage line, which takes a sharper, more aggressive form and mirrors the more pronounced sill cover. The wheel arches of the 4-series concept bulge more aggressively than those of the four-door. These body adornments also lend BMW’s smaller coupé a more aggressive look than its bigger brother, the 6-series. At the front, the family resemblance to the saloon is carried through, with headlights that link into the hallmark kidney grille. The grille itself is made more prominent by protruding more aggressively from the surrounding sheet metal. “The front end displays a clear link with the 3-series family, but with a sporting take on the theme with precise contours and multi-faceted surfaces,” says BMW. The execution of the intersection of the grille and headlamps is sportier thanks to the narrower lamp units built around on-trend ‘squircle’ projector lamps. Underpinning the front is a gaping front air dam that extends the full width of the nose. The production coupé is tipped to have a more toned-down airdam, although elements of this design may influence the forthcoming M4. Another departure for BMW is the hockey-stick-shaped decoration on the front wings, behind the wheel arches. Some sort of adornment will appear on the production 4-series, but how close its design will be to this feature is unclear. The interior is based closely on the 3-series saloon’s and, ignoring the concept car decoration in this design study, appears to be directly carried over. The instrument pack, minor switchgear and instrument panel’s upper moulding, for example, mimic the 3-series saloon, with its high-mounted infotainment screen. Likewise, the radio and air-con modules in the centre console are carried over from the saloon. BMW hasn’t released any chassis or engine information with the concept. But our sources say that the production 4-series will feature engines selected from the saloon range and mirror the bulk of the line-up in today’s 3-series coupé. Today’s global best-seller is the 320d, which will morph into the 420d. Seven further engines are likely to result in a 418i, 420i, 428i and 435i petrol line-up and 425d, 430d, 435d diesels. The long-awaited M4 is also a key 4-series variant. Chassis settings are tipped to be firmer than the saloon’s to further establish the 4-series as a separate model.